Mexico City is no stranger to 4-star restaurants. Just last week, hometown favorites Pujol, Quintonil, and Biko were named to the 50 World’s Best Restaurants List. Not only that, Mexico City is home to several global celebrity restaurant empires, like Cipriani, Nobu and Morimoto to name a few. I walked by Morimoto in New York City plenty of times, but never had a chance to try it. So when I stumbled across a Morimoto restaurant in Mexico City in the Camino Real Hotel, I was excited to give it a try. The Camino Real Hotel is one of the nicest 5-star hotels in Mexico City. 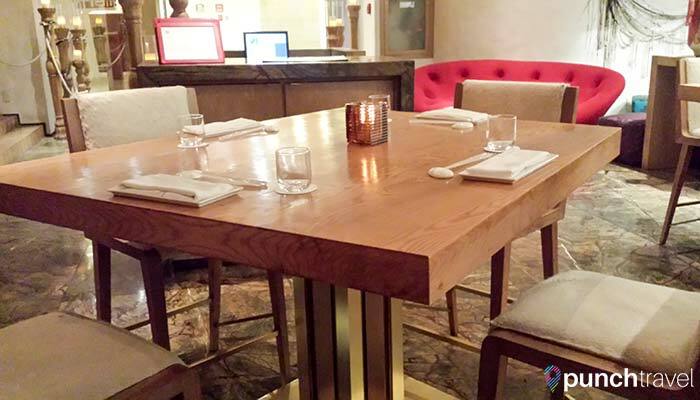 In addition to Morimoto Mexico City, you will find China Grill, Beefbar and several other fine-dining establishments. Opened in October 2011, Morimoto Mexico City, is the namesake restaurant of acclaimed chef, Masaharu Morimoto. Walking into the restaurant, the first thing I noticed was the trendy design. Designed by Thomas Schoos, the large space space features a sushi bar, open kitchen, cocktail bar, separate smoking and nonsmoking sections, and several private and semi-private dining areas. In the center of the space is an indoor terrace which provides a view of the sky. A mix of large wooden high-top tables are perfect for large groups, while traditional four-top tables offer a more intimate dining setting. The restaurant is decorated with large, origami-inspired lamps and brightly colored sofas. A rope art installation inspired by Japanese fishing ships winds through the whole restaurant tying the concept together. Chef Morimoto is known for his Japanese fusion cuisine combining traditional Japanese techniques and tastes with local and Western ingredients. 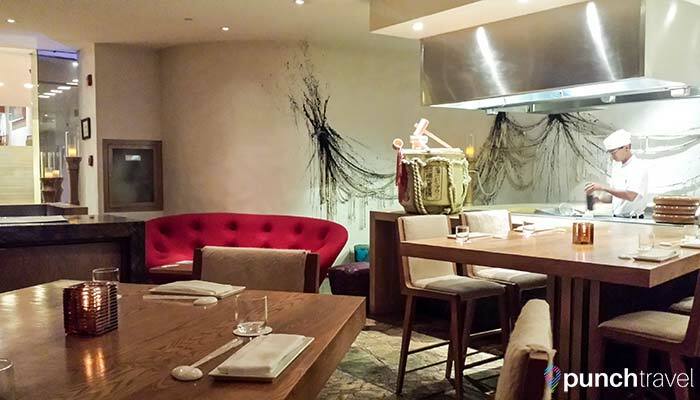 At Morimoto Mexico City, the menu features Japanese dishes with a dash of Mexican influence. In addition to the a la carte menu, there is also an extensive sushi menu, as well as an omakase menu for 1100 pesos. We opted to go the a la carte route, since we had sushi the previous day. First order of business was drinks, and Morimoto Mexico City offers several sake-based cocktails, plus a modest list of wines and beers. 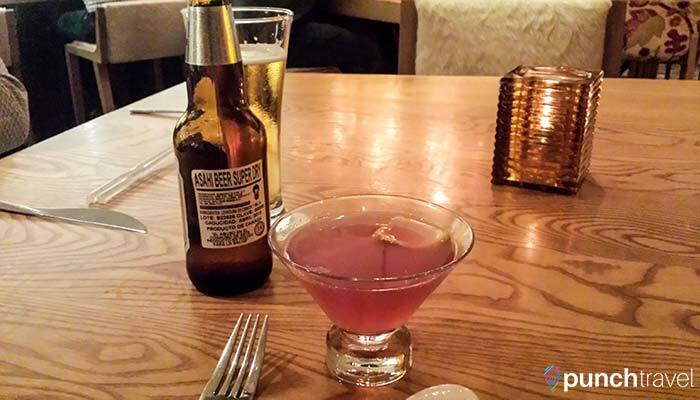 Matt had an Asahi Super Dry beer, and I tried the sake cosmopolitan. The sake was apparent, but not overpowering. We decided to save room for dessert and skip the appetizer course. However, there are several cold and hot appetizers and you could easily make a meal of all the choices. One of the options that looked good was the morimoto sashimi which features tuna, salmon, and eel accompanied with five local salsas. Also on the menu are a few salads, and a sampling of soups and noodles, including ramen, soba and a duck meatball soup. For the main course, I ordered the braised short rib, which I had high expectations for, and it certainly did not disappoint. In the center of the beautifully plated dish was a generous portion of short rib. 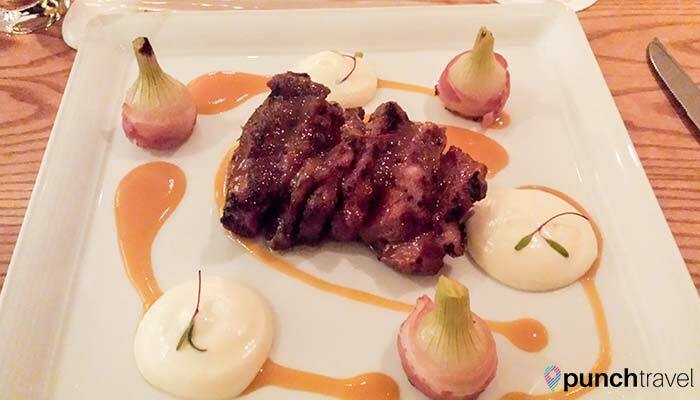 The fatty short rib was braised in a sweet and salty marinade, and accompanied with a rich cauliflower mousse. Dressing the plate were three roasted shallots wrapped in bacon and the entire plate was topped with a sweet and tangy mango honey sauce. The dish was savory and sweet, perhaps a tad on the salty side, but all in all absolutely delicious. 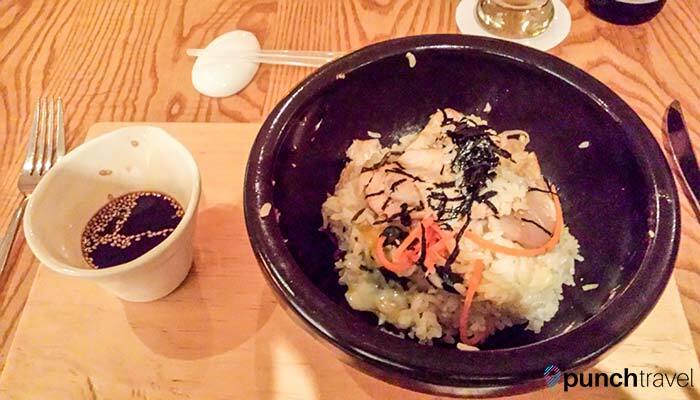 Matt ordered the ishi yaki buri bop, a Japanese take on the Korean bibimbap, served table-side in a hot stone bowl. The waiter brought the dish over on a wooden tray and quickly seared the raw yellow tail tuna against the sides of the sizzling bowl, and then mixed the rice and vegetables together with the poached egg. Topped with a soy and sesame sauce, the dish was perfectly prepared and the crispy rice at the bottom had a perfect hint of spice. Several unique desserts are available to choose from but we went with the Chocolate Progression. 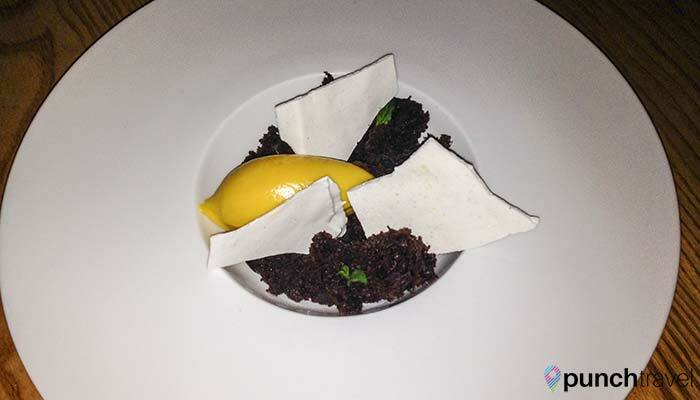 The dish is composed of several variations of chocolate, with a few ginger wafers that melt in your mouth and a scoop of mango sorbet. At the top of the dessert, the chocolate was rich and chewy, not unlike a brownie. As we dug deeper into the dish, the chocolate turned into crunchy nibbles of goodness, with a hint of passion fruit. As one would expect from a Morimoto restaurant, all of the dishes we tried were perfectly plated and tasted divine. The only thing lacking was the service. For a 4-star restaurant such as Morimoto Mexico City, I expected stellar service that exceeded my expectations. Instead, we received a perfectly acceptable level of service that would be fine at other restaurants, but not for a restaurant of this standing. The portions were perfectly sized, and priced between 300 and 450 pesos for main courses – about half of what it would cost in New York. Morimoto is open for lunch and dinner, seven days a week.